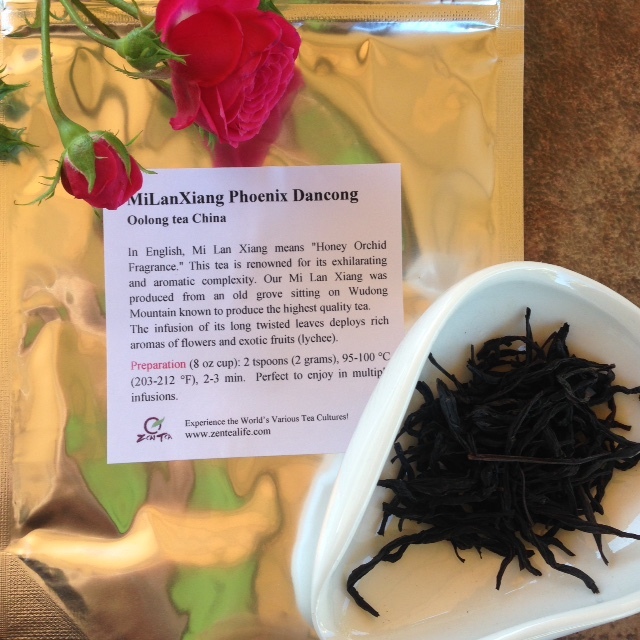 Buddha-Mom Tea : My first Mi Lan Xiang Phoenix Dan Cong Oolong. The long twisted leaves and strong floral aroma are the first things I noticed when opening the bag. Wonderful dry leave scent, like peaches I thought initially! As this is my first Mi Lan Xiang ( meaning 'Honey Orchid Fragrance)Phoenix Dan Cong Oolong I decided, naturally, to make a production out of it and headed outside with my mini-tray, my vintage gaiwan, a thermos full of piping hot water, and found a place in the sun to experience this nice and slow. The aromatic complexity is simply nuts. One of those teas I tend to 'huff' for awhile before even thinking of steeping. The rinse smelled so good I drank it and am so glad I did, what a waste it would have been to dump this! And the first brew was so different from the rinse that it was a pleasure to be getting a second impression with the 'first real steep'! Further infusions with the water temperature dropping down to to around 180 were sweet but lacked the vibrancy of the steeps at a higher Fahrenheit so I brewed some fresh water at 205 and hit the leaves another three times. Very warming sensations, a sweet little buzz in my head, a feeling of abandon took over so much that I even let QuanYin, one of my curious birds wander over for a bit! Flavors range from peach and apricot to honey with a slight malty note. A real pleasure to drink and my thanks go out to Zen Tea for making this tasting session possible. Bravo and cheers and a deep bow thrown in there for good measure as I sit here on my back porch and feel fully awake, alive and aching with gratitude for all the good things in my life, this hour with this tea being on the top of the list at the moment! The end of a good session with a remarkable tea.